When North was in second grade, I told them we were going on an “adventure,” when we were actually just going on a walk. This was a holdover from when the kids were very small and I used to call any outing an adventure. North patiently explained to me that it’s only an adventure if it involves “climbing a tree or going to another country.” This became a family joke. Well, North’s climbed a few trees since then, but until this month they hadn’t had the other kind of adventure. They returned from the seventh and eighth-grade Spanish immersion trip to Colombia on Monday evening. I wasn’t there, so I’m going to tell the story in North’s own words, though their texts, mostly to Beth. I check my texts less frequently, so Beth was the main conduit of information. Also, some of my text exchanges with North were in Spanish. I included a little of that as bonus content for those of you who can read Spanish. All texts are shared with North’s permission and they were at least as redacted as the Mueller report. Note: All time stamps are U.S. Eastern time. It was an hour earlier in Bogotá. North: Were you expecting me to go to bed at 6:30? Beth: No, but maybe by 9? North: It’s always seemed normal to me, but I’m realizing now that the fact that I can speak 2 languages is really cool. Language is still such an abstract thing that we don’t quite understand, and the fact that some people can understand more than one is really spectacular if you think about it. Me: Divertiste? Usaste una silla de ruedas o caminaste? North: Guess what I got you? Beth: Wow that might put your luggage overweight! Beth: They said that might happen! 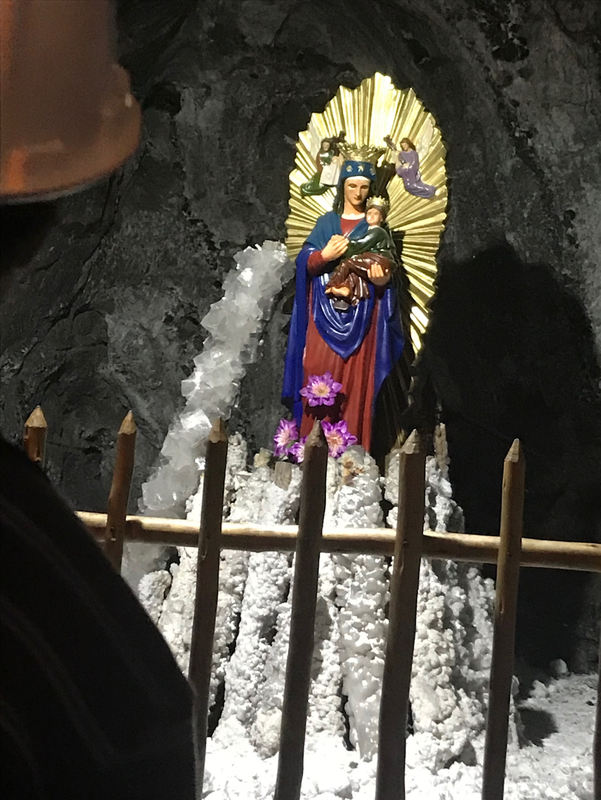 Lots of sun in the salt mine? North: Today they said something I was very annoyed about, the only after school activity available was robotics and they said, “but robotics is not for girls.” There is so much wrong that sentence and I would have proved them wrong and gone to robotics, but I don’t like robotics. Me: Did you survive the hike? Me: What kind of terrain? Me: And did you dance at the dance? Me: What’s the plan for tomorrow? Beth: You can start tonight! Beth: Did you go on the mountain hike? Beth: A stray or did it live at the hotel? North: I put the salt in my carry on. 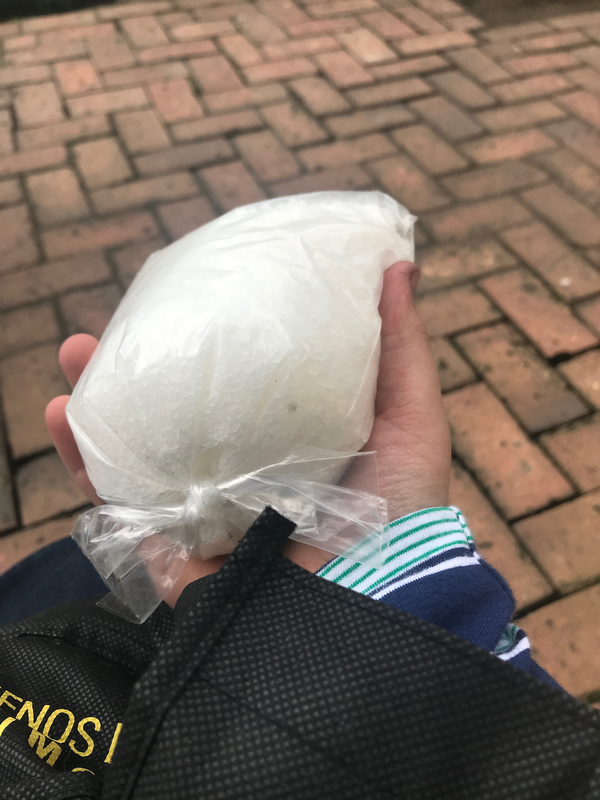 Beth: Did they confiscate it? Is it weird to be back where most people are speaking English? A few hours later, North came off the plane, tired but very happy. It’s been nice having everyone at home together for the past five days, but I’m glad they finally got to have the non-tree climbing kind of adventure, thanks to the hard work of the teachers and administrators of both schools and the generosity of their Colombian hosts. ¡Gracias a todos! Late Friday morning, after just four days at home, Beth and I were pulling into the parking lot of Noah’s school to pick him up halfway through the school day, for our last college trip. We were going to Admitted Students Day at Ithaca College. I asked Beth if she would sometimes like to know if North will go to this high school so she knew exactly how nostalgic she should feel about the fact that Noah will be finished attending it in just over a month. She said no. Turns out that’s just me. We rolled into Ithaca around dinner time. It’s a slightly shorter trip than Rochester and we didn’t have to make a detour to the airport this time. We found our AirBnB, which was in a neighborhood of stately old houses in eclectic architectural styles, many of them slightly shabby but cheerfully decorated with strings of lights or Japanese lanterns or Tibetan peace flags or colorful woven hammocks on the porches. 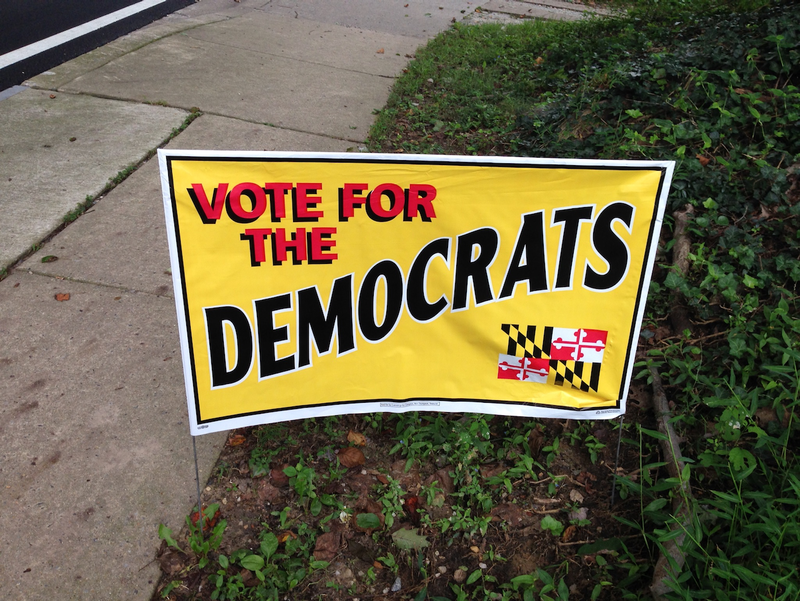 The yards were dotted with flowers or yard signs supporting liberal causes, pretty much the same ones you’d see on a stroll through Takoma Park. We walked a few blocks to a pizza place, where we got pizza, Stromboli, and garlic knots. While we were standing in line to order, there were some college kids behind us in line, talking about how they were meeting friends at ten, so there should be time to go to the gym after dinner and before that. It took me back to my younger days when plans could conceivably start at ten. Now if they end at ten, it feels like a late night. It made me hope when Noah’s up late a year from now, it’s not always because he’s working. Noah wanted to watch a movie, so after some discussion we settled on A Serious Man and watched the first half before bed around ten, because though I might like to reminisce about late nights in college, I don’t actually want to relive them. In the morning, we had breakfast at the AirBnB and headed over to the college. We registered and settled in at one of the tables set up in the middle of the stadium. There was a student activities and services fair going on around the perimeter. Beth went and collected some brochures and freebie pens while Noah set up his laptop and tried to get some work on his Chaucer PowerPoint presentation done. Like hobbits, we had a second breakfast of muffins and bagels. Eventually it was time to move to the folding chairs set up at the front of the stadium floor. A dance club performed and then some administrators spoke and then the admitted students left to go hear a panel discussion of current students while the parents stayed behind and heard more administrators and a student speak about Ithaca. Beth said she thought it was a good idea to split the kids off from their parents in case they had questions they didn’t want to ask in front of the their parents. There was a buffet lunch set up in the stadium and the vegetarian options were much better than what we ate at RIT. There was cheese tortellini, baked tofu, salad, fresh fruit, and cupcakes. After lunch, it was time for the academic presentations. We went to the Park School of Communications, where we started off watching video presentations and speeches by faculty and students. There are ten majors in the school—Noah was accepted to Emerging Media—but what struck me was how much interaction between them and flexibility within them there seems to be. This was something that concerned Noah at RIT. He thought the Motion Picture Sciences major seemed like it might be too narrow. There also seems to be a lot of institutional support and encouragement for undergraduates to attend conferences or get travel funds to film events or meet sources for documentaries. Two of the students who spoke had oddly specific things in common with Noah. One had two moms and was making a documentary about meeting her donor and half-siblings. Another travelled to the Women’s March and filmed it with a 360-degree camera, which is also something Noah’s done (even with the same kind of camera) while assisting CWA’s videographer. It almost seemed like a sign. Of course, when the singers at RIT sang a song called, “It’s Your Puzzle,” that also seemed like a sign, because Noah’s Common App essay was about puzzles. And the RIT mascot is a tiger and when he was two, he loved to wear his tiger costume and insisted on being addressed as Mr. Tiger when he did so. (It was also the mascot of his first elementary school.) When you’re trying to see the future, signs are everywhere. Next we had a chance to meet with the director of Emerging Media and two current students in the major. We had a surprisingly long and detailed talk with them. One of the students is a double major with Computer Science—Noah is very interested in the intersection between computing and film. Noah got some handouts outlining the requirements for the major and different tracks you can take within it and asked some questions about how his AP credit in calculus and computer science will count as coursework. 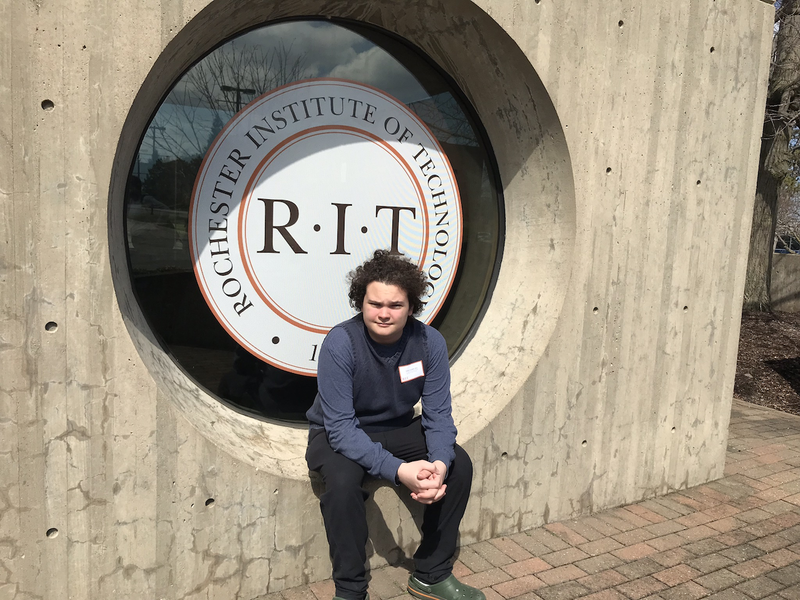 The director asked what other schools Noah was considering and while he, of course, favored Ithaca, he said RIT was a good choice, too. 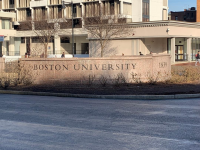 He was somewhat dismissive of Boston University, which he said was more focused on graduate students and wouldn’t offer the same kind of opportunities for undergrads. It reminded me how at BU, the tour guides seemed to think highly of Ithaca, but not RIT. Everyone has a different opinion, but hearing a few of them can help a composite picture emerge. 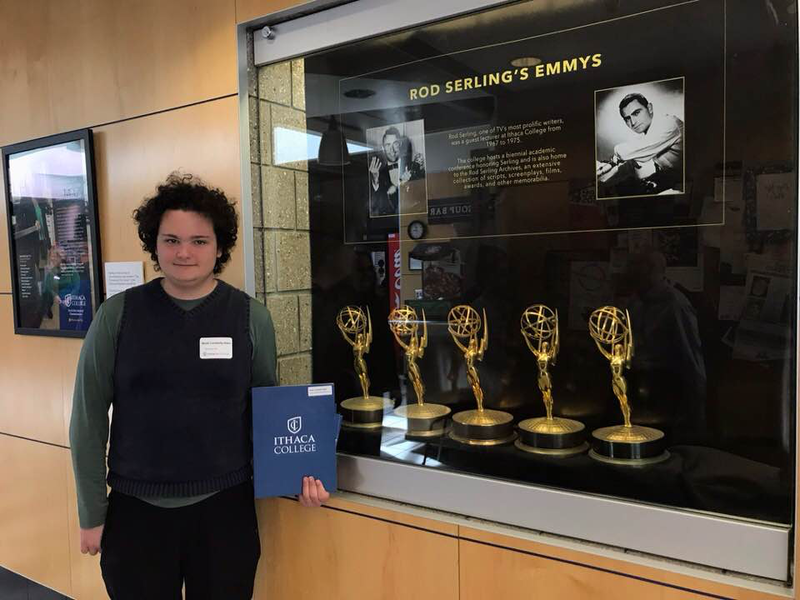 Before we left campus, Noah posed by the display of Rod Serling’s Emmys, which are housed at Ithaca because Serling taught there. (Noah’s merit scholarship is named after Serling.) We could have gone on to see dorms and dining facilities, but we were all kind of tired, so we went back to the AirBnB, where Noah and I read the second act of A Doll’s House and then I napped while he worked on the Chaucer presentation until it was time to leave for dinner. 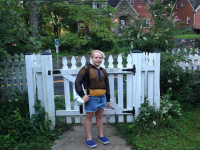 We ate at Moosewood when we visited Ithaca in August and Noah wanted to go again and I certainly had no objection. I had a samosa wrap, Beth got a vegetable soup and a cheese plate, and Noah had pasta with asparagus in a cream sauce. We stopped at an ice cream parlor on our way home and watched the rest of A Serious Man. While not as unfortunate as the besieged protagonist of the film, Noah is a serious young man and not prone to quick decisions. He’s going to make a pros and cons chart over spring break, which started today. He’s behind in a couple classes and he worked on statistics all day today, but I hope he has a little space over the next few days to relax and to weigh his options. Taking out the compost, making coffee in long underwear. The children persist in growing up. 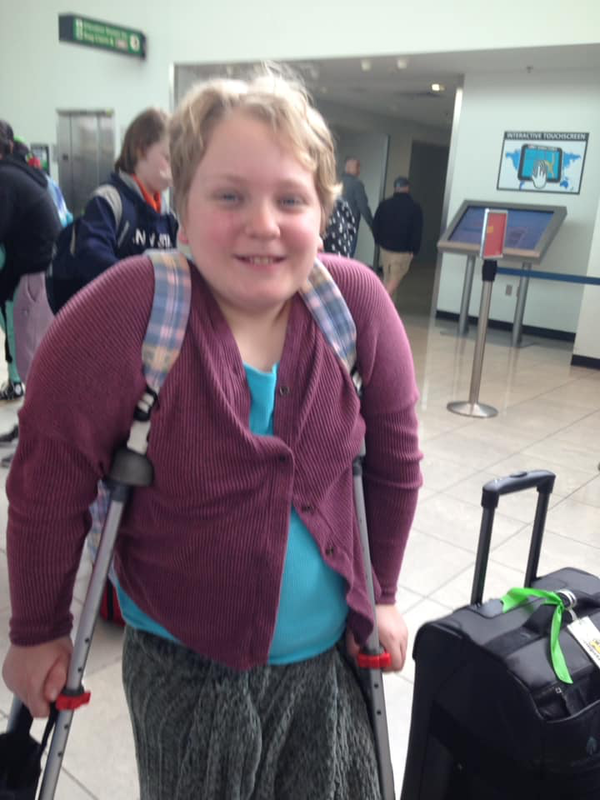 Late Friday morning we dropped North off at BWI airport to join thirty-six of their classmates in the Spanish immersion program who were embarking on an eleven-day trip to Bogotá. 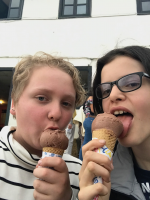 The trip takes place every other year—you go in seventh or eighth grade—and in the alternate years, the French immersion kids go on their own trip. 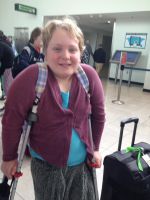 We’d hoped North would be off crutches by the time they left and the fracture is healed, but despite twice-weekly physical therapy, they still have pain when they put weight on that leg, so the crutches went to Colombia with them. That meant we needed to stay in the airport for an hour or so, until their suitcase was checked. Not that we were the only parents lingering. Apparently sending your twelve-to-fourteen year old off to a foreign country without you is a little unnerving. But the first couple days they were gone we received a steady stream of texts and pictures. It’s slowed down, but we’re still getting dispatches from them and we also got a nice email from their host mom, so we don’t have to wonder how they’re doing. They seem to be having a great time. More on North’s adventures in a later post. We arrived at our hotel around 9:30, after a long drizzly drive. As we drove north, I could see spring receding. The flowering trees disappeared and there was even a dusting of snow on the ground at the highest elevation, near the Pennsylvania/New York border. We had dinner at a brick oven pizza place about one hundred miles from Rochester. For much of the ride, Beth and listened to podcasts—Throughline, Invisibilia, Hidden Brain, and Desert Island Discs while Noah disappeared into his headphones to listen to his own podcasts and watch television on his laptop. In the morning we had breakfast at the hotel. The breakfast room was crowded with teenage boys in track suits, some kind of high school sports team from Montreal, we gathered. They were well behaved—which isn’t always the case for large groups of teens in hotels—but it made for tight quarters. There were also a couple teen boys with middle-aged parents I thought might be going where we were. When we arrived at RIT, we were greeted by the pep band, wearing orange and white hockey jerseys, standing on the steps of the building where the event started, and playing a cheerful tune. I noticed there were a lot more young men than women streaming into the building. (We later learned from a tour guide the student body is 70 percent male.) When we took our seats in the stadium where there was a mostly female a cappella group performing. I joked to Beth they were there to convince all these young men that there are women at RIT. There were some speeches by administrators and then we were split up by schools. 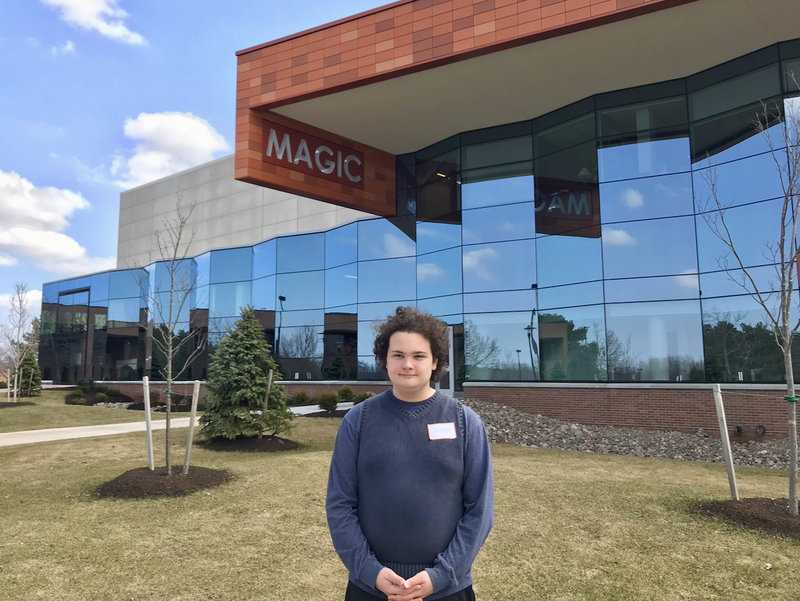 We followed a student carrying a School of Film and Animation sign to the brand-new MAGIC Spell Studios building, which opened this fall. We started in an auditorium where the interim director and other faculty gave an overview of the different majors within the school. It was during this presentation we realized that co-ops (paid, full-time, semester or summer-long internships required by most majors) are not required in the School of Film and Animation. For me, the co-op opportunities had been one of RIT’s draws. When it was time to tour the building, we went with the Motion Picture Sciences guide. This is the program Noah applied to. It’s an engineering-based program that covers the technical aspects of film. We saw studios for color correction, sound mixing, a big green screen (but not the biggest one they have) and a couple grip cages full of equipment. Noah said later it was a really impressive facility and he’d know. Lunch was provided, but the vegetarian option was a sad, sparsely filled roasted vegetable sandwich that was mostly lettuce and peppers. It was similar to lunch at UMBC, actually. I wondered if they use the same catering service. There was fresh fruit and brownies, though, and I had smoked almonds in my bag, so I supplemented my lunch with those. Next we took a residence hall tour. The guide showed us a standard dorm room and lounge. 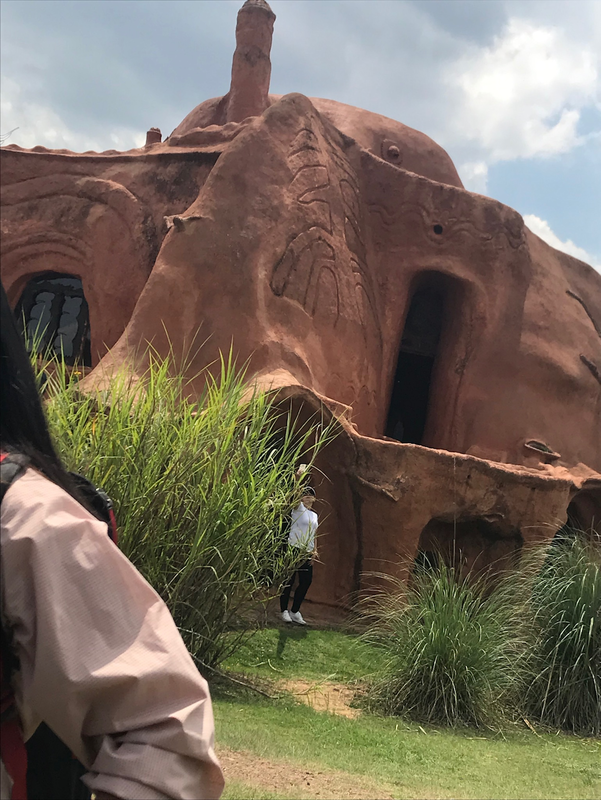 The most interesting feature of the tour was the network of tunnels that connect the dorms to each other and to the academic buildings. It’s a nice feature on a campus with harsh winters, but they’re in use all year. There are student-painted murals on the walls, some dating back to the nineties, but there’s still blank space you can request to paint. There are laundry rooms and mailrooms in the tunnels under each dorm, and even a convenience store. It’s a whole hidden, underground part of campus. In Noah’s information packet there was a coupon for the Ben and Jerry’s in the student union, so we were forced to go get ice cream. 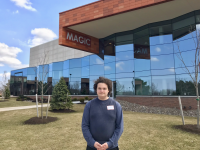 After that, we went to Disability Services and learned how Noah can pick up his ADHD medication and to Spectrum Services to talk to two very nice administrators about what kind of support and social and organizational coaching they offer. 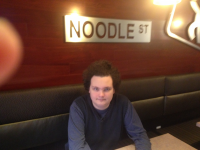 For those of you who weren’t reading this blog back in the day, we had Noah tested for Asperger’s when he was nine. 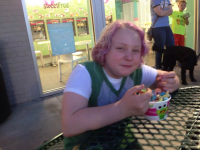 He didn’t quite meet the criteria, but the psychologist who tested him said he had a lot of the same characteristics and challenges kids on the spectrum have. And you don’t need an official diagnosis to use Spectrum services, so it’s nice to know there’s a built-in support network if he cares to take advantage of it. That appointment was our last stop of the day so we went to the bookstore to use another coupon to buy A Handmaid’s Tale (because Noah and I are thinking of making it our next mother-and-son book club book and I’ve lost my copy) then back to the hotel room so Noah could research a paper about Chaucer for a few hours. But before he started to work, we debriefed a little. He was concerned that the Motion Picture Science major might be too technical and not creative enough. He’s interested in technology and skilled with it, but he is interested in the bigger picture of storytelling, too, so to speak. We talked about how he’s eligible to take other classes in the School of Film and Animation that might be more on the creative side, even if they’re not requirements. He seemed pensive and unsure. I think this is going to be a hard decision for him, but maybe the visit to Ithaca next weekend will put the schools side to side in a helpful way. It’s true, both Noah’s mamas advised him to shop around, but the time for that is almost over. There’s just one more college to visit and sometime in the next few weeks, he’ll make his choice. Noah skidded into the end of first semester in a blur of late work and later nights. He never did finish all his English assignments, because they’d gotten backed up behind other work, but what’s done is done (or not done, I guess). Then the kids had a three and half day weekend (early dismissal Friday and Monday off) to allow teachers to complete their end-of-semester grading. This was really nice for Noah, who had almost no homework. He practiced his drums or bells every day and we read so much of Crooked Kingdom that we almost finished it. On Monday I gave both the kids some chores around the house and yard and Noah sawed up some weed trees Beth had felled earlier so they could be bagged with the yard waste. He also helped me make baked ziti for dinner. And then the next week barely happened. The kids went to school on Tuesday, but snow was forecast, so they had an early dismissal. It did sleet and then snow, about an eighth of an inch on my official measuring table, and it was over by early evening, so of course there was a snow day on Wednesday and a two-hour delay on Thursday. Yes, there was an inch or two in other parts of the county and yes, the delay was not for snow, but for morning temperatures in the single digits. I was still exasperated, because it meant we went over our limit of snow days for the year before January was even over. The school district has added a day in June and can add one more before we come up against the Governor’s absurd last-day limit. After that they either start chipping days from our already shortened spring break or they apply to the state for a waiver. I’m not enthusiastic about either of these options, to put it mildly. As a work-at-home mom, I really like getting those days back later in the year, but I’d also like for the kids to have a spring break. It was also too bad one of North’s Honors Chorus rehearsals was cancelled, because it only meets for two months. On Friday morning, it was snowing again and I was surprised the kids went to school on time. But, puzzlingly, there was an early dismissal, which had the buses on the road at a time of day when it was actually snowing harder than it was when they would have normally come home. But never mind. I no longer expect any of this to make sense. I took advantage of having the kids home to make them shovel the walk, because this snow (about an inch and a half) actually required shoveling, unlike anything that fell earlier in the week. Meanwhile, my friend Nicole who lives in Calgary, reports that her ninth-grader went on an outdoor education field trip that same week. It started with the kids skiing twelve kilometers uphill and staying for two nights in their choice of either a “backcountry cabin,” which I’m thinking was probably unheated or a snow shelter they built themselves. Let’s think about that contrast for a moment and hope the Canadians never invade, because, as Beth observed when I told her about this trip, if they do they’re going to kick our American butts. Well, moving on…The next weekend was something of a relay race because Beth and Noah and I left on two separate trips. One of Beth’s cousins died unexpectedly (and quite young, in his mid-thirties) and she went home to Wheeling for the funeral. She left straight from work on Friday and flew home Sunday morning. Shortly after she got back, Noah and I left for Boston for a quick trip to visit Boston University. Between March and August of last year we visited eight schools with Noah. He applied to three of those, plus BU, which he got interested in late in the process. 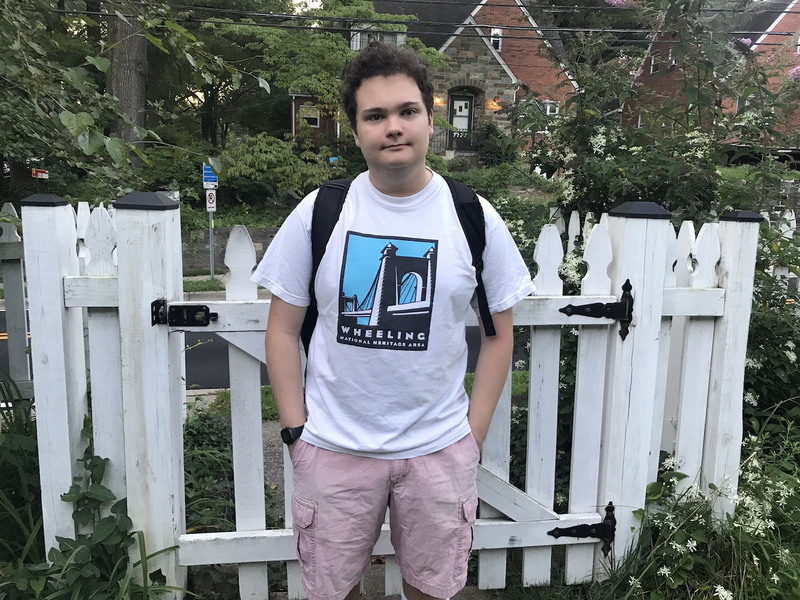 He’s been admitted to Ithaca and UMBC (and the honors college at UMBC), but he’s still waiting to hear from R.I.T. and BU. 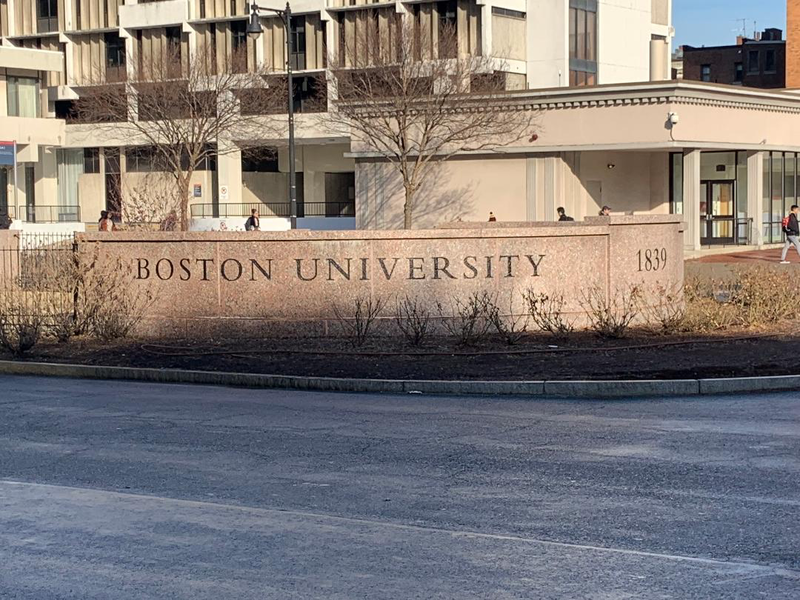 He was having trouble ranking his choices without having visited BU, so we decided to make one last first-round college visit. Ironically, we were in Boston (to visit Emerson) on our very first college road trip almost a year ago, so it feels as if we’ve come full circle. We could be travelling a lot more this spring, though, for admitted students days, (and if he makes the first cut for a scholarship he applied to at Ithaca, for an interview there). Getting to Boston turned out to be a little more exciting than anticipated, at least at the very beginning of the trip. We had a late afternoon flight on Sunday and around ten in the morning, when I decided to re-arrange all the cards in my wallet so everything I needed would be handy, I discovered my ID was missing. So, a half hour later when Beth got home from her emotionally draining trip (which she made with a bad cold), I met her at the front door crying and she had to calm me down. She helped me look for the card for another half hour and then we gave up and she investigated flying without state-issued ID. She found you can sometimes, at TSA discretion, if you undergo extra screening, so I brought a long-expired passport (issued in 1987) with me and hoped for the best. When we got to the airport, I showed the agent the passport, my voter ID, and my debit card. She asked if I had anything else with my name on it, like an insurance card. But I get my health insurance through Beth’s job so the card has her name on it but not mine. I showed it to her anyway and pointed out that Beth’s last name is the other half of Noah’s and oddly, that seemed to do the trick. I was taken aside to be patted down, but they let me through security. I’m not sure that would have happened if I hadn’t been a middle-aged white woman. The flight itself was uneventful. We took a shuttle to the hotel, found a nice little crepe place for dinner, and were back at the hotel by eight. I needed to decompress and I considered whether a swim or a reading Crooked Kingdom with Noah would be more relaxing. I went with the reading. We finished the book and then I read The Night Ocean on my own while he watched something on his laptop until ten o’clock, when we went to bed. It was the night of the Super Bowl and we were in Boston, but I didn’t hear any celebration. There was a police presence in the lobby of the hotel and we saw four busses full of police officers going down the street—bound I don’t know where—so I guess it wasn’t quiet everywhere in Boston that night. In the morning we had breakfast at the hotel and headed for the university for an information session and tour. The information session was pretty standard. When the administrator running it asked all international students to identify where they came from, in order to determine who had come the farthest, he seemed surprised at how many of them were from China. I wondered if Chinese students take advantage of their lunar new year break to visit colleges abroad. The tour was next. It was a beautiful day for it, in the high forties and sunny. The sidewalks were wet with snowmelt and everything looked washed and shiny with it. We’ve been to a couple urban campuses and this one was more like Carnegie Mellon than Emerson, by which I mean there’s a defined campus set down in the middle of a city, rather than being tucked into a couple adjacent office buildings. It’s bordered on one side by the Charles River, which was partly frozen, and the T runs down that street, which I imagine is convenient. Some of the buildings are brick and concrete rectangles, but there are more pretty Victorian and Gothic buildings, though very little green space. 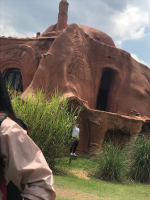 Some of the dorms are huge towers (one houses 1,800 students in three interconnected towers) but there are also converted brownstones that house fifteen to sixty students each. The dorm room they showed us was in one of the tower-style dorms (not the biggest one), which I guess was honest, because more students end up in those. After lunch at an Asian noodle place we’d spied on the general tour, we took another tour, this one of the School of Communications. 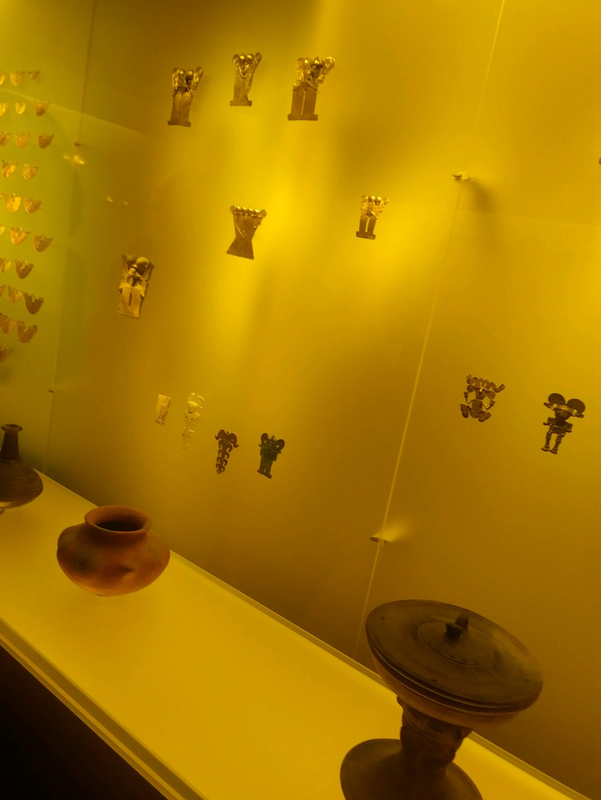 It was our own private one—with three tour guides! They talked a lot about how state-of-the-art the facilities and equipment are, which is important to Noah. I’m no judge of this, but Noah seemed to agree with that assessment. Also, the fact that professional broadcast journalists regularly use their studios is impressive. 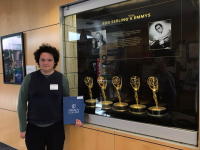 When the guides asked him where else he’d applied, they said a lot of people who apply BU for communications also apply to Ithaca and Emerson, so that made me feel he must have visited and applied the right schools for what he wants to study. 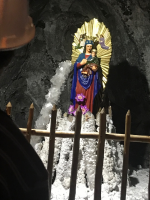 One discordant note, though, was that all three guides kept making jokes about how communications students don’t like math, not just once, but over and over again. And Noah’s very good at math. It got to the point where I wanted to mention he took AP Calculus BC in his junior year and aced the exam, that he got an almost perfect score on the math SAT and that he’s taking magnet math this year, even though he’s not in the math magnet, just to make them stop. It’s actually relevant because it made me suspect there’s not as much cross-fertilization between film and computer science as Noah would like. That collaboration between departments is one of the reasons Ithaca and R.I.T. both seem like good fits for him. Noah didn’t have much to say after the tour, which isn’t unusual for him. He often needs time to let experiences settle before he makes a judgment. After the School of Communications tour, we had a couple hours before our shuttle to the airport. It would have been nice to explore Boston or the campus a little more, but he had homework, so we got a chocolate milkshake (him) and a strawberry smoothie (me) at a café where we meant to stay so he could work there, but it was playing sports radio at a pretty loud volume, so we headed back to the hotel lobby where he wrote responses to two chapters of Brave New World and I charged my phone and worked on this blog post. Back at the airport, I managed to get through security yet again, and we had dinner at Sbarro (him) and Friendly’s (me) before getting onto the plane and flying back to a busy week for both of us. We’ve all been hoping this will be an easier semester for Noah, because he swapped Logic for Statistics and the CAP Senior Seminar for Health. It’s hard to judge right now because we’re only two weeks in and they’ve both been irregular, disrupted weeks. He’s struggling to catch up from having been out Monday (and to be honest, I was, too, for a few days). He entered this weekend behind in three subjects. But whether second semester is easier or not, in four months he’ll be done with high school and looking forward to starting a new chapter in his life, somewhere north of here. “It was a big day for Noah,” Beth said when it was all over. It started with him dressing up in a suit for the first time ever. 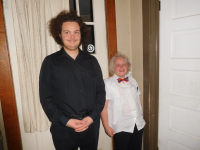 There have actually been a lot of occasions when we considered buying Noah a suit—mostly notably when he was in sixth grade and we got legally married, and for various oral presentations he’s made in high school. The C in CAP stands for Communication, so there have a been a lot of presentations over the past few years. But we got married in our living room, and he had a school-issued tuxedo shirt for band that year, so a suit seemed like overkill and then he had a habit of saying, “I really should have a suit for this,” a day or two before or he needed to make a presentation so we never bought one. This time he thought to ask well ahead of his senior CAP presentation. The senior presentation summarizes five school assignments—two required and three of the students’ choosing—and explains what the student learned in them and in CAP in general. Noah spoke about and played clips from the movie he made this fall about the process of making his Halloween costume, the podcast of interviews with parents and alumni of his preschool, a dystopian film about social media, a paper comparing 1984 to the Trump campaign, and a research paper about a local hospital’s plans to move and the impact of the move on the community. The assignments spanned his four years of high school and gave a nice overview of his skills as a researcher, writer, audio technician, and filmmaker. It’s also the last big assignment he has in a CAP class because in their senior year, CAP students mostly take classes outside of CAP. The senior seminar will focus on interview and resume skills before it ends in late January and his AP Lit class will last until the end of the school year, but other than that, he’s finished with CAP. 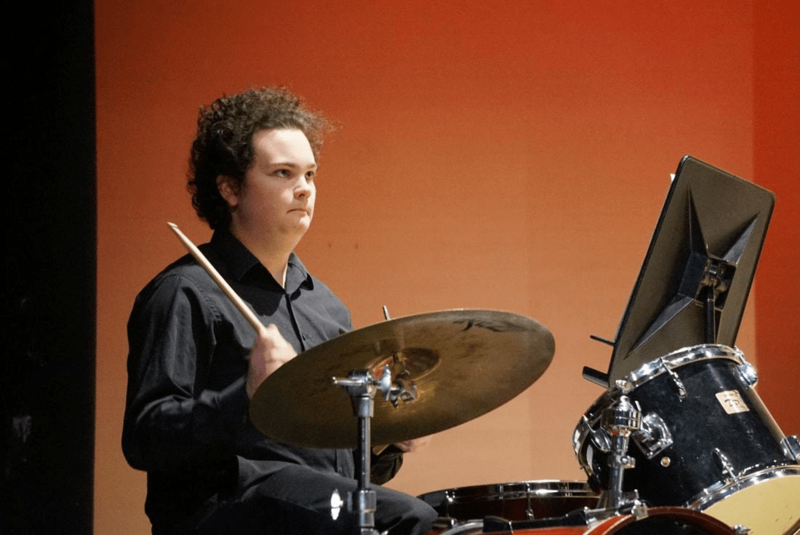 Afterschool activities were cancelled while the police searched the building, but they completed their search in time for evening activities to go on as scheduled, which was nice because Noah had his penultimate high school band concert that night. He got home at his usual time and studied for a King Lear test before we had an early dinner of spinach quesadillas with black beans and corn on the side (which North ate an hour before we did before hopping on a bus to play rehearsal). By six o’clock, we were on our way to his school. There are five bands at Noah’s school: two jazz bands, the ninth-grade Concert Band, Symphonic Band, and the Wind Ensemble. 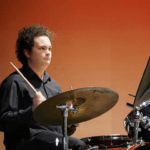 Noah plays percussion in the Wind Ensemble. There were a couple seasonal nods in the jazz selections. The Jazz Combo played “Autumn Leaves,” and “Let it Snow! Let it Snow Let it Snow!” The non-jazz bands play in order of expertise, so they get better as the concert goes along, not that any of them sound bad. Blair has a great music program. Peter and the Starcatcher is a prequel to Peter Pan. I’d seen North play Peter in a scene during their acting class showcase last month and few more scenes done by the whole cast at a preview event a week before opening night, but other than that, I didn’t know much about it. North is playing four roles, two in each of the rotating casts. In the older cast, they are Alf (a sailor) and a mermaid. In the younger cast, they are Slank (the captain of one of the two ships), and Fighting Prawn (the king of the fictional island of Mollusk). Being in two casts meant North had to be at nearly every rehearsal for two and a half months. It’s been intense and it’s meant a lot of late nights. 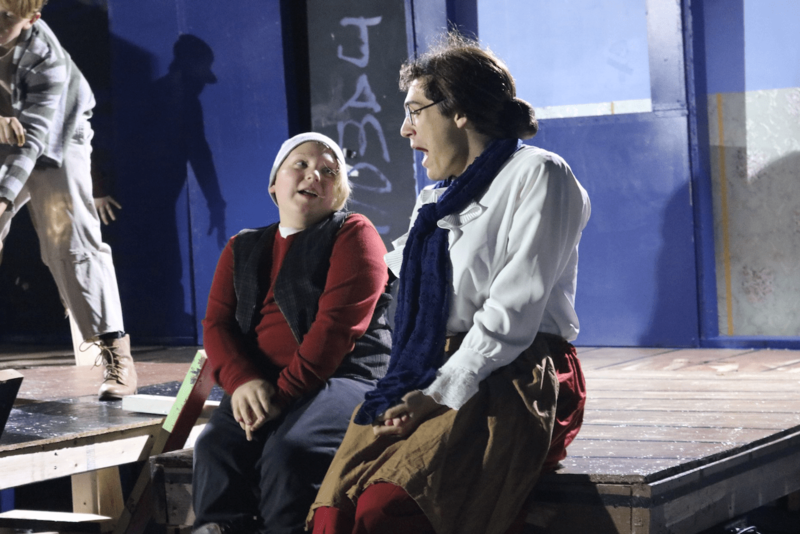 Opening night featured the older cast, who are (mostly) in seventh to twelfth grade. The set was beautiful and quite elaborate, featuring two ships with moving parts and an alligator that runs along the ceiling. North’s part as Alf was bigger than I thought from what they’d been saying and I also didn’t know Alf had romantic scenes with a character played by an eighteen-year-old boy in drag. But that’s part of why we go to the theater—to be surprised. It was a fun show, with good acting in many roles, but especially the girls playing the pirates Black Stache and Smee, who had excellent chemistry with each other. North’s often cast in comic roles and Alf was no exception. They’re playing more against type in the other version of the show, at least with Slank, who is something of a villain. Fighting Prawn is comic, too (though I think the script’s attempt to re-write the Indians of Peter Pan only partly succeeds in erasing the racism of the original). As I write, North’s at the second of five shows this weekend. They will be at the theater from 11:30 a.m. to 10:30 p.m. today and from 11:30 a.m. to 9:30 p.m. tomorrow. And then they will do it all over again next weekend, with five more shows. We’ll go to closing night so we can see North in their younger cast roles. You might expect flying in a show about Peter Pan, and other than the alligator and a stuffed cat, there isn’t in this one, but nevertheless, the theater’s announcements about the upcoming show said it was “taking flight.” It’s been quite an exciting few days here, watching our kids test their wings in endeavors academic, musical, and theatrical. Well, life goes on. There was a party on Saturday night for the seventh and eighth-grade Spanish immersion students at North’s school to welcome the Colombian exchange students who are visiting this week. It was held at a vineyard owned by the family of one of the eighth-graders about an hour north of us. Everyone picnicked and the kids ran around in the dark with glowsticks and sampled grapes off the arbors and there was karaoke and man playing guitar and singing in Spanish and there were two bonfires for making s’mores. Going to a party was just about the last thing I wanted to do on Saturday. I thought I was so sad I’d cry if anyone mentioned the Kavanaugh confirmation and that if anyone talked about anything other than the Kavanaugh confirmation it wouldn’t seem important enough to bother discussing. But it was fine, better than fine actually. After all, all the adults there were parents and our kids always seem important enough to talk about. And when conversation did turn to Kavanaugh, it actually helped a little to talk to other broken-hearted people. I felt particularly bad for the woman who works for NARAL. Two days later it was Columbus Day, otherwise known as parent visitation day at the kids’ schools. This is the last time we’ll have to balance both visiting both the middle school and the high school, which has proved challenging the past couple years. Both kids have so many classes it’s hard to know which ones to prioritize. Both kids’ school operate on a block schedule, which means they have four long periods a day, rather than eight short ones and each class meets every other day. (Actually, the high school bell schedule is a little more complicated than that but you don’t need the minutiae.) The high school runs an all-period day on visitation day so parents have the option of going to any class they like, but the middle school keeps to its normal schedule, so our choices were North’s Spanish, English, chorus, and science classes. Except that day most of the first period (Spanish) was given over to another welcome event for the Colombians, a breakfast in the courtyard. We’d volunteered to bring bagels to the breakfast so that was our first stop. We arrived in the courtyard and examined the spread, which consisted of bagels, muffins, doughnuts, and coffee cake. I told Beth it was a nightmare for the gluten-free, though I suppose if you were gluten-free or otherwise low-carb you could have spread cream cheese on the tomato slices in the bagel fixings area. I’m not, so I had a sliver of raspberry coffee cake and half a whole-wheat bagel, with veggie cream cheese and some of the aforementioned tomatoes. North was excited that there were asiago bagels left when they got to the front of the line and that they got to spend some time with Zoë, who’s not in any classes of their classes this year. I talked to Zoë’s mom, who works as a lawyer for Health and Human Services and is about as discouraged as you’d expect these days. We left before the breakfast was quite over because we’d decided to attend Noah’s third and fourth period classes before circling back to North’s school. Third period was the CAP senior seminar. This is the only required class CAP students have in twelfth grade (though they also have to pick from a short list of English classes). In the senior seminar they work on their college essays, do a service project, an independent academic project, and present a portfolio of several assignments from their four years in CAP. 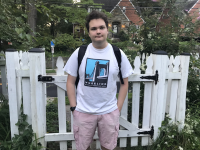 There are three sections of the class and Noah’s in the one taught by his ninth-grade history teacher, Mr. G.
At the beginning of class Mr. G had the parents in the room introduce themselves (it was just me, Beth, and one other mother) and asked us how we felt about the college search. Beth said it was sad to think about Noah leaving and the teacher was surprised. He said he expected us to say something about being worried about money. Then Mr. G started to expound on the importance of the essay, how tens of thousands of dollars could ride on getting them just right, because the better the essay the more schools they’d get into, the better the chance of getting into one with a large endowment, and the better the chance of getting substantial aid. Then I realized why he was surprised at Beth’s answer. He’d wanted us to set up this point for him. I was glad we hadn’t because while of course money’s a concern for almost any parent of a college-bound student, I don’t think cranking up the pressure on these kids is the right approach. They’re all high-achieving, highly motivated students, not slackers. They’re doing what they can and that’s all we should ask of them. So I found it ironic that the next thing Mr. G did was hand out a worksheet on dealing with negative emotions, including anxiety. They worked on these while he met with a couple students to go over their essays. We followed Noah to his next class, AP English Literature. 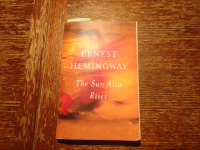 I wanted to hear the discussion on The Sun Also Rises because I’ve been reading it to him. Noah is a slow reader so I often read his school assignments to him, particularly if they are of interest to me, and any novel for an English class automatically falls into this category. We were not quite three-quarters of the way through it on Monday, and when Ms. A put the quiz questions for the last reading up on a screen, I realized with a little surprise I wouldn’t have done very well on this quiz, which was character identification from quotes. I think I’ve disengaged from the book because, as I mentioned in my last post, it’s not the best book for me to read in this particular moment. I read the words aloud, but I’m not thinking much about them. I resolved to pay better attention to the last four chapters. 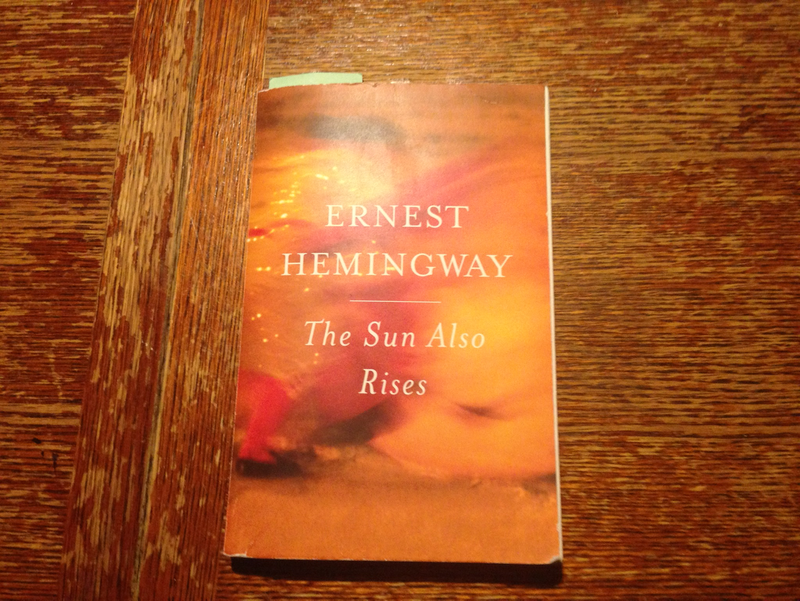 If I’m going to read this classic, I should know something about it when we finish. So that was useful, on a purely personal level. Next Ms. A had the students edit a sample introductory paragraph for a four-paragraph essay on the AP exam in small groups. When they’d finished, the whole group discussed thesis statements, grammar, wording, and general AP exam strategy. Then it was back to The Sun Also Rises. The students had to read a passage, pick one important word from it and then explain why they’d chosen it. Ms. A used this exercise to get them to practice close reading. While most CAP students take AP English Literature, it’s not a CAP-only class like all his other high school English classes to date. Later I asked him if it was harder, easier, or about the same. About the same, he said. After English, we went to the band room to drop off some brownies Beth made for a bake sale to benefit the band and then we decamped to Starbucks where we killed a little time until North’s chorus class started. We were going to chorus because it was North’s favorite class and the one they most wanted us to observe. As we waited in the room for Mr. N and students to arrive, I remembered chaperoning the sixth-grade chorus on a field trip last March and how rowdy the kids had been. 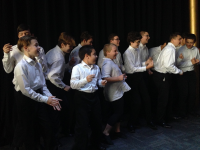 North’s in advanced chorus (comprised of seventh and eighth graders) this year and I wondered if maybe after some winnowing and self-selection, the group would be better behaved. The short answer was they were not. And it was a shame because Mr. N’s attempts at discipline kept interrupting the flow of his lesson. And as is always the case in these situations, it wasn’t all the kids, or even most of the kids causing problems. It only takes a few uncooperative students to throw a wrench in the works. The class started with vocal warm-ups, then a sight-reading exercise, and finally they practiced two songs for their winter concert, sometimes in sections, and sometimes all together. Mr. N’s instruction and critiques made me reflect on how little I know about choral music, but I think many observers would have been puzzled by his praise of the altos for being “vampires.” Later, North explained it was because they were singing in minor key, which can sound creepy, so when people do that well he tells them they’re vampires. We left after chorus. North had science next and they thought they were going to start working on their hydroponics project. This sounded interesting and I felt a tinge of regret about not managing to fit in any of their academic classes this year, but if Beth and I were going to have lunch together (a traditional part of this day) we needed to go. Later North told us they didn’t actually start the building the hydroponics equipment, that it was a lecture on cells instead. Beth and I had time for a lunch at the arepas place in Silver Spring and a quick run to the grocery store for celery, which I needed for dinner. We got home shortly before Noah did. Soon both kids were home—North, who was in the house briefly before heading to acting class and play rehearsal, and Noah, who settled in to work on his National Merit essay. He’s a semifinalist and hoping to advance to finalist, which could potentially lead to some scholarship money. But even if it doesn’t, I’m proud of him and I hope he’s proud of himself. He’s worked hard and however things turn out, he’ll still go to college and the sun will keep rising every day. There are no neutrals there. We’re a few weeks into the school year, which means North’s activities are starting. They’re taking an acting class at the rec center, they have rehearsals for Peter and the Starcatcher starting next week and they’re going to try out for glee club at school. Rainbow Alliance should start meeting soon as well. They’re also involved in a program at the rec center for middle and high school students to write TED talks and they get weekly coaching on their speech, which is on the theme of assumptions. September also means a lot of meetings. We’ve been to North’s school twice, once for a meeting about the seventh and eighth-grade Spanish immersion trip to Columbia next spring and once for Back to School Night. We’ve also been to Noah’s school twice, once for a twelfth-grade CAP meeting and once for its Back to School Night. It was my very last Back to School Night for Noah. I might have been sad about that, but they keep you busy running from one classroom to another at those things, so there wasn’t really time. Tuesday we went to Children’s National Medical Center for a meeting of their trans kids’ support group. We went for the first time in July and it was our first time back since then. (We were out of town during the August meeting.) The kids and parents meet separately. The middle school group is pretty small, consisting right now of North and two trans boys who are both in eighth grade. North seems to like it and it’s interesting to hear other parents talk about their experiences, although ours are often a little different because being non-binary presents different issues. Meanwhile, Noah’s working on getting materials together for his first college application. UMBC has a non-binding early action application deadline in a little over a month. It’s the only early application he’ll do as the others on his list only have binding early decision deadlines and he doesn’t have a clear front-runner. We went to tour the campus about two weeks ago. (The kids had the day off for Rosh Hashanah.) We’d been to their open house in August, but we couldn’t stay for the tour because North had a chorus camp concert that day. Nothing we saw on this tour really changed Noah’s mind about the school one way or the other, but I was glad we went so we wouldn’t wonder what we’d missed. It was the same as it always is. We listened to a few bands and shopped at the craft booths, where North bought some bath salts and a bundle of sage for Xavier’s birthday (as well as some to keep) and we ate festival food (tofu burgers and plantains for the adults, fried rice or lo mein for the kids and ice cream for everyone). We visited Lesley at the booth for the kids’ preschool and she praised Noah’s work on the podcast and told us one of my former students from George Washington University (now in her thirties with a husband and a toddler) visited the booth and is considering the school because after she graduated from college she babysat for us for a long time and she remembered hearing us say good things about it. I had this student in two classes in the 2001-2002 school year and we still exchange Christmas cards. How’s that for a long-term recruitment plan? The first band we saw was singing Hazel Dickens union songs. The audience skewed older and when we walked in, I wondered if the kids were going to find this boring. I remembered how when we’d seen Magpie perform (perhaps in the very same middle school gym) for a crowd of mostly middle-aged and elderly Takoma Park lefties seven years ago, North actually fell asleep in my lap. One reason I wanted to go to this session is that we know the lead singer. He’s the dad of a girl who has acted at Highwood and the rec center drama camp with North in quite a few shows. (She also attended the kids’ preschool in the year ahead of North. Why, yes, everything always does come back to that preschool.) I always appreciate it when people we know turn out for North’s performances and I like to pay it forward, and not just for kids. I enjoyed the set and I even found myself unexpectedly moved when the whole room was enthusiastically singing “Which Side Are You On?” It made me want to make a difference and reminded me that I’d been meaning to get set up as a writer for Postcards to Voters, which is just what it sounds like, a campaign to get people to write get-out-the-vote messages on postcards to Democratic voters in districts with close races. My friend Megan (a mom from preschool, naturally) had posted about it on Facebook a few days earlier and it struck me as something I could easily do. Other than writing modest checks, I haven’t been very politically active recently and there is an election around the corner. But I’m not a natural organizer. 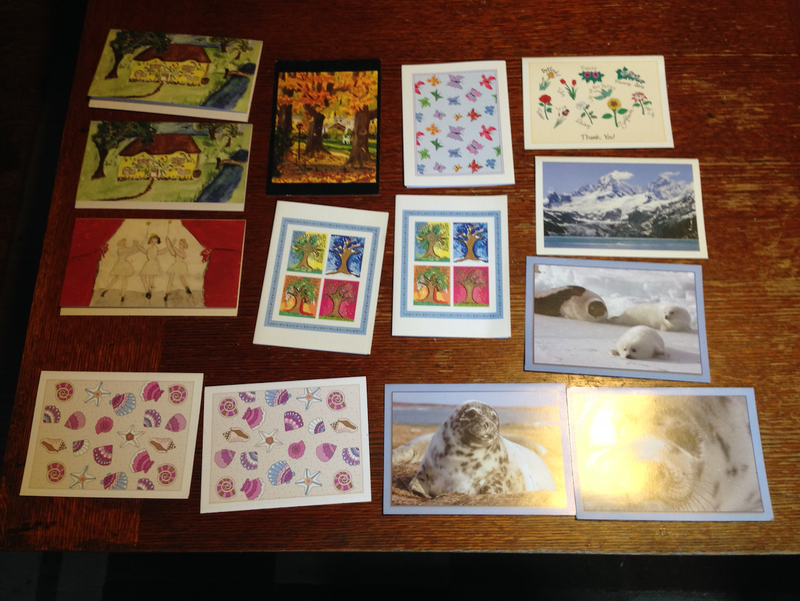 The idea of calling people up on the phone or knocking on doors gives me hives, but writing postcards…Sure, I can do that. So a few days later, I wrote a sample postcard, photographed it, submitted it, and committed to write fifteen postcards in three days. (You choose how many you want to do, from four to fifty at a shot.) Within forty minutes, I’d been approved as a postcard writer and I was sent fifteen addresses from the Cincinnati metro area. 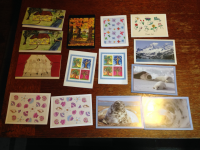 I went to the post office, bought some postcard stamps, came home and started writing postcards. While I was writing postcards North was (coincidentally) burning their bundle of sage in the fireplace in the same room. It felt as if we were both purging demons. The whole experience was very satisfying and I did another batch to people in the Anaheim area last night. 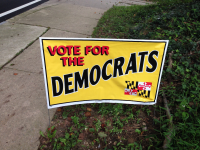 If you’d like to do this, too, check out the Postcards for Voters web site. The midterms are in less than seven weeks and they could make a real difference in the direction our country takes. I’m going to be writing postcards as often as I can between now and then because I know which side I’m on. Well, it happened again. The seemingly endless summer break that stretched out before us in mid-June ended. Today Noah started his last year of high school and North embarked upon the middle year of middle school. 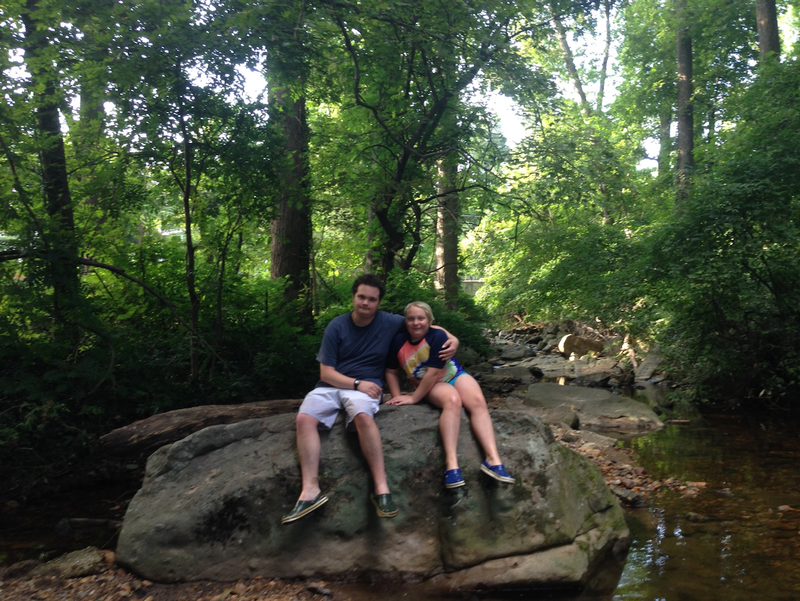 I took the kids on our traditional end-of-summer creek walk. We splashed through the creek, observed the spider webs that span it and the crawfish that crawl on the bottom. There were a couple of deer on the bank near where we got in and they were seemingly unimpressed with us and disinclined to run away until we were quite close. I could see the velvet on the male’s antlers. North swam in the deeper spots, but Noah stuck to wading, maybe because we discovered when we set out that his bathing suit was missing (left we thought in the changing room at the swimming hole in Ithaca or in the hotel in Altoona) so he was dressed. 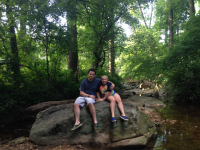 As I moved slowly and cautiously through the creek and over the fallen logs that blocked our way, mindful of the bad fall I took two years ago in the creek, Noah started to point out slippery rocks and good handholds to me. It felt like a role reversal, and a sweet one. We left the house at nine a.m. and drove to the Kennedy Center. Highwood Theatre was having its season preview in a small performance space there and North was singing in three numbers, one each from Peter and the Starcatcher, The Wedding Singer, and Footloose. They don’t actually know which fall show they will be in yet. They’re trying out for an audition-only production of A Gentleman’s Guide to Love and Murder in about a week so we’ll know shortly after that. 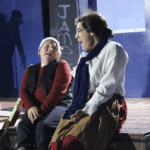 The preview consisted of songs and scenes from several plays, including The Glass Menagerie and Sweeney Todd. It looks like it will be an interesting season. I’m sure we’ll be seeing many of the shows. North didn’t have any solos but they were one of two featured backup singers in “It’s Your Wedding Day” and when the other kid forgot a line it turned into a solo. North was busy making a test run of the strawberry-yogurt parfait and cucumber-tomato-fresh mozzarella concoction they are assembling in mason jars for school day breakfasts and lunches. Noah spent most of the day editing podcast audio and updating his journal about the experience. Beth made pancakes for breakfast, as she traditionally does on the third morning of three-day weekends. North was busy decorating their school supplies, making stripes on the binder with duct tape and affixing stickers of musical notes to it. In the afternoon Beth and North went to a church pool party and we had picnic dinner in the backyard. Beth asked the kids what they wanted out of the coming year. Noah said to graduate and get into college. Beth predicted he would get into one or more. North wanted to have their friends in their classes and to make new friends. After dinner we all went to Ben & Jerry’s for last-night-of-summer ice cream, another family tradition. We let Noah choose the venue because it’s his last year of high school. It would have felt a little more celebratory if he was finished his essay about the podcast (and essay I didn’t know about until that morning) but you can’t have everything. As it was he was up late working on it. The podcast itself turned out really well. The big day came and the kids went to school. Noah found his errant bathing suit while he was packing his backpack and was on his way to the bus stop at seven and forty minutes later North went to meet their bus (and then waited twenty minutes because it was late). I went about my day and I was startled when Noah came home about an hour early at 2:55. “Why are you home?” I asked. “This is when I get home now,” he said cheerfully. For the first time in his high school career he doesn’t have a ninth period class, which was happy news. He was pleased with his schedule, too, because he’s in Silver Lens (which produces longer films than the ones he made last year for the school television station) and the highest level band (where he’s percussion section leader) and while he didn’t get the teacher he wanted for the CAP senior seminar, he also didn’t get the one he’d least like to have. This teacher is awful, so he really dodged a bullet there. The other two are both good. He’s had all three before. (And even better he didn’t know the objectionable teacher was teaching the class so he didn’t have to worry about it all summer.) He had no homework due the next day so we read The Book of Dust, which we’d just started over the weekend and then he took a nap. North got home and reported they don’t have any classes with Zoë or Giulia, but their day was good otherwise. They also had no homework. We read Serafina and the Splintered Heart until it was time for me to start making dinner. 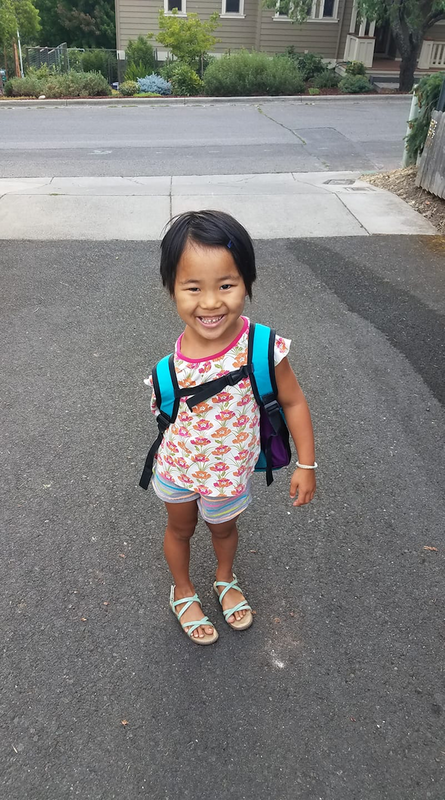 About a week before my kids went back to school, my niece Lily-Mei (aka Lan-Lan) started kindergarten, or the beginning of the beginning of her K-12 education, at a nature-based public charter school. Here’s to a great school year for my kids, my sister’s kid, and your kids, whether they are at the beginning, the middle, or the end. The Home Stretch, Part 2: Climbin’ up the Mountain, Children! Wednesday of last week Beth, North, and I engaged in some role reversal. A little background: Noah chose to make a movie for his CAP Diamond project, a culminating junior year assignment. 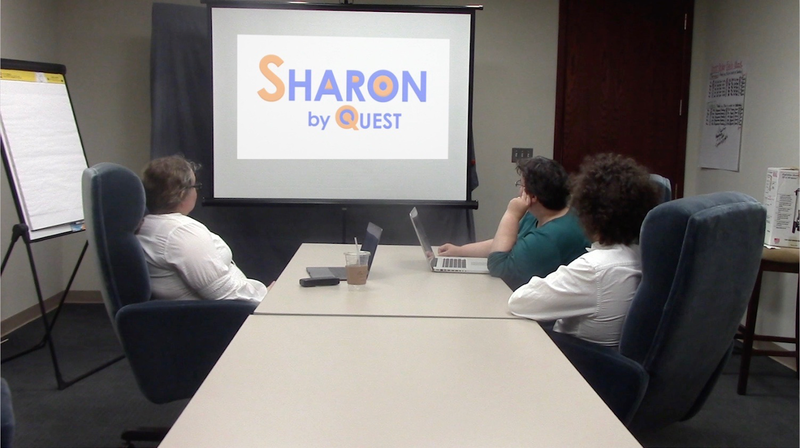 It’s called Sharon and it’s about a fictional social media company called Quest that uses an artificial intelligence entity named Sharon to customize users’ newsfeeds, which leads to the splintering of news consumption and the proliferation of fake news, but also to increased profits for the company. I tried to encourage Noah to employ our resident actor, but he wanted all adult or at least teenage actors because all the characters are adults. So he played the CEO, Beth played a company engineer, I played the profit-driven board member, and two of his classmates played a television reporter and a camerawoman—this part was filmed at his school’s television studio. 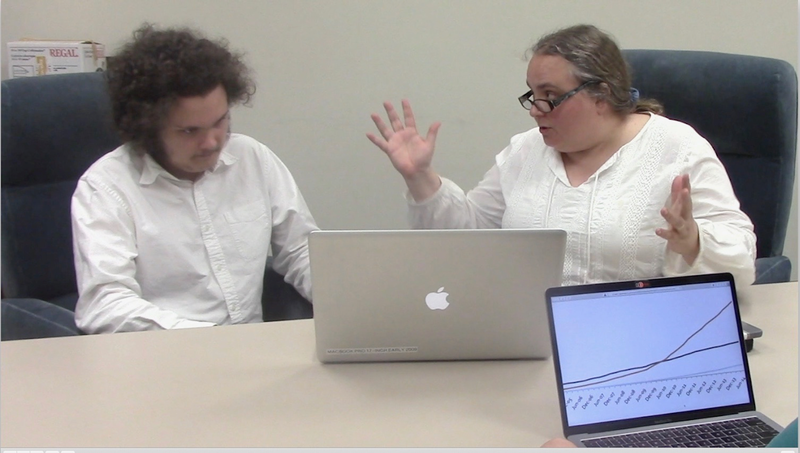 Noah was able to spend most of last weekend recording Sharon’s speech, adding stock footage, and editing the film because he only had a little bit of calculus and Spanish homework, which he finished Saturday morning. The house was unusually quiet all weekend because he was ensconced in his room working and Beth and North were on a church camping trip from Friday afternoon to Sunday afternoon. Noah did take a few breaks, long enough to listen to me read a big chunk of Song of Susannah and to watch Get Out with me. Would you believe I made it more than a year without hearing any significant spoilers about this film and then just a couple months ago basically learned the whole plot? I don’t remember where. Anyway, fifteen months after the rest of you probably saw it, I finally saw this movie, and I enjoyed it very much, even with the spoilers. Noah liked it, too. It’s nice to have someone to watch horror movies with, as Beth is not a fan. He said one of his teachers almost showed it to them earlier this year, but ended up going with The Shawshank Redemption instead as fewer kids had seen it. As the year comes to a close, a few of his teachers have been showing movies or turning their classes into study halls, especially in the AP classes, which have slowed their pace considerably since the exams are over. Calculus is the only AP class that’s still going full steam, though they read a book of short stories in English and took a test on three hundred vocabulary words after the exam and he’ll be making another movie on biodiversity for AP biology this weekend. Unless something comes up at the last minute, we’ve been to our last end-of-the-year events for North. We attended a church picnic on Memorial Day and the spring chorus concert was on Tuesday. Sadly, Noah couldn’t come because he was still editing the film. North was put out because it’s the second chorus concert he’s missed this year and he also missed The Canterbury Tales in April. I understand their disappointment and I wonder if they will hold it against him as long as my sister held the fact that I missed her performing the lead role in her sixth-grade production of Barnum against me, which is to say, to this day. It’s almost enough to make me wonder if I should require him to go to these things, but North has quite a lot of performances and Noah has quite a lot of homework. At least he saw the honors chorus performance and both School of Rock and Romeo and Julian this year, so he’s batting about .500 and I think he made it to the most important ones. Beth had quite a long day the day of the chorus concert and Noah had an even longer one. The band was performing at Noah’s school’s graduation and he needed to be at school at 6:30, so Beth set her alarm in order to wake him up at 5:15. This is the second year he’s played at graduation, so I guess he’ll know exactly what to expect next year when he’s one of the ones in a cap and gown. After an early dinner Beth, North, and I left Noah at work on his film and drove to his school, where the concert would be held. (North’s school has no auditorium so any event that’s too big to fit into the band room is held at Noah’s school.) North had to be there a half hour before the concert started so we parked and North went into the building while Beth and scooted over to the Starbucks that’s around the corner. When we got back to the school, took our seats, and surveyed the program, I guessed the concert would last between two and two and a half hours, as there were a total of fourteen songs played by the orchestra, the a cappella club, and the combined sixth-grade and advanced chorus and Noah’s eighteen-song concert last month stretched to three hours. But after the orchestra and a cappella club had performed and it was time for intermission, the chorus teacher told us intermission would be short so the concert could resume by eight and finish by eight-thirty. Even though I was enjoying the music—it’s especially nice to hear a middle school orchestra when you’ve recently been attending elementary school orchestra concerts—this was welcome news. I like music, but I’m not a fan of late nights for me or the kids. I thought the orchestra’s first song, “Tribal Dance” sounded familiar and later North told me they played it in orchestra either in fourth grade or maybe at orchestra camp. I often joke about how often young musicians have to play or sing the popular music of their parents’ youth so I was a little amused that the a cappella group sang “Stand By Me,” which would be more like the music of their grandparents’ youth. Still, they sounded good. When the chorus took the stage, a teenage boy in the row in front of us said with mock indignance, “It’s 8:05!” but all the exits and entrances and moving about of chairs, music stands, and risers between groups had gone very efficiently so I wasn’t about to complain. 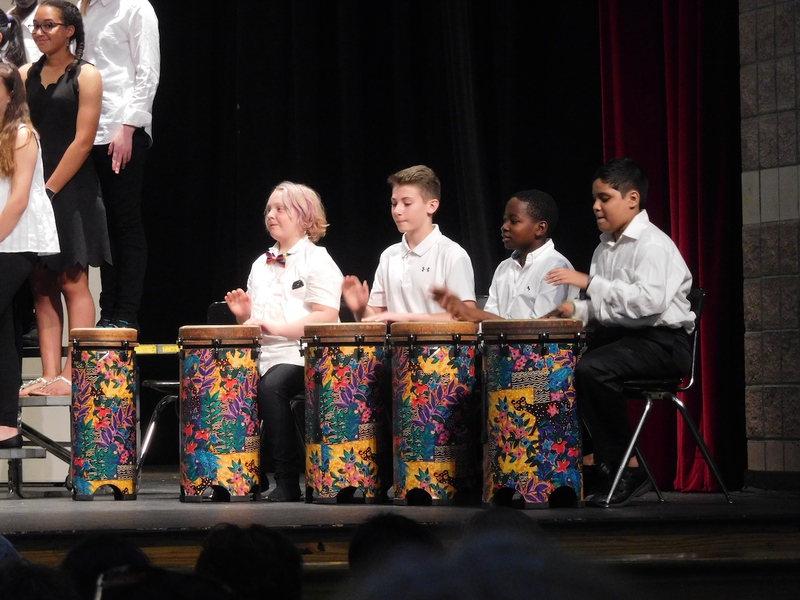 North was pleased that the sixth-grade chorus was singing with the seventh and eighth graders at this concert, taking it as a sign they’d improved sufficiently over the course of the year to sing with the older kids. And North got some individual recognition on the program, too, with notations of their status as an Honors Chorus member and a member of Tri-M Music Honor Society, a group North will be President of next year. North was wearing a rainbow-striped bowtie purchased especially for the concert but it kept coming undone and hanging vertically and they kept fiddling with it all through the chorus’s six songs. I hope this wasn’t too distracting for them. We’ll have to make sure it’s tied more securely at their next concert. 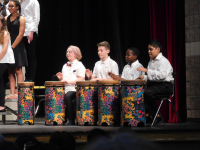 As always, there were songs in different languages-four in English, a pretty song in Latin called “Et in Terra Pax,” and a Nicaraguan folk song called “Todos Quieren La Banana,” during which North and a few other sixth graders played the conga drums. This was a fun bilingual song about how people of all nations love bananas. My favorite of the songs in English might have been the African-American spiritual “Climbin’ Up the Mountain, Children!” but maybe that was just because that’s how the end of the year feels sometimes, especially for my overworked eldest. North preferred “Can You Hear?” during which they played the drums again. The eighth-graders had a song to sing by themselves during which time the sixth and seventh graders held up their lit cell phones, like people used to do with lighters. The concert didn’t end by 8:30 but it was close, around 8:40 rather than the 9:00 or 9:30 I’d predicted. 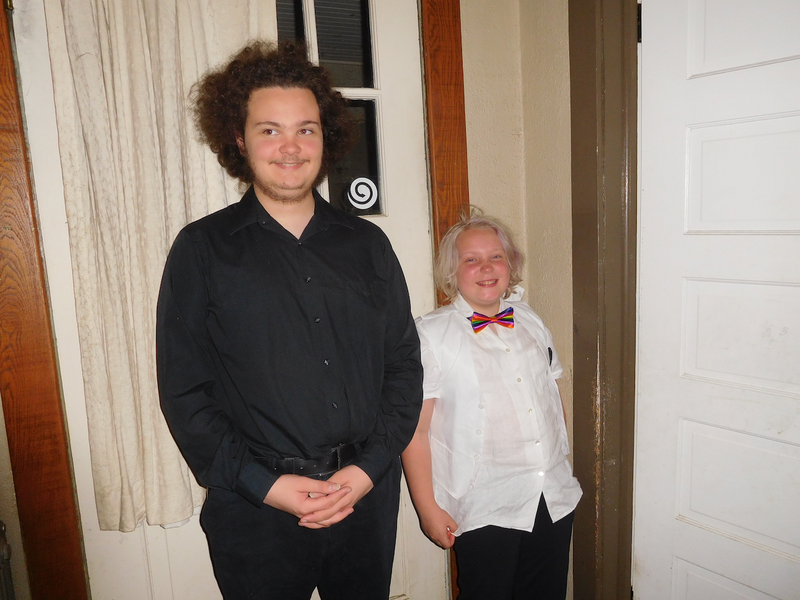 When we got home Noah was still working and still wearing his band clothes from that morning and since both kids were dressed up at the same time, I thought we should get a picture. He was up until midnight working on the film. He’s still climbing up the mountain. In addition to the biodiversity movie, he also has to make a poster and write and memorize a presentation about Diego Rivera (in Spanish) and both assignments are due Monday and there’s a big calculus packet due Wednesday so it should be a busy weekend, but the summit is in sight, only a little over a week’s journey from here. The school year is winding down. The kids still have three weeks of school left, but North’s school’s end-of-year awards ceremony was on Wednesday, so we’ve entered the home stretch. The way these events work is that if your child is being honored you get a letter in the mail, but you don’t find out what which award it is until you arrive. At Noah’s middle school you didn’t find out until they called your name and you came to the stage. At North’s middle school the names—nine pages of them—are printed in the program. Having experienced both, I can say there are advantages to each system. The element of surprise keeps it interesting, but it can be stressful, too. A little background– in seventh grade Noah got an award for perfect attendance, which would have been nice except he didn’t have perfect attendance that year. It was a letdown, as he didn’t get any other awards. At the eighth grade ceremony, I was nervous the whole time, and relieved when he got the award for maintaining a 3.5 or higher GPA for every semester of middle school because that is a bona fide achievement. So we were able to scan the program when we arrived at the high school cafeteria where the ceremony was being held. We’d guessed the honor would either be North’s honorable mention on the National Spanish Exam, or being nominated for the Tri-M Music honor society, or perhaps both. It was the former, which was near the end of the long program, so we settled in to watch kids file up onto the stage and to clap for them. I said later if I’d designed the program I’d have called the first section “Do-Gooders” and the second section “Smarty Pants” because it started off with community and school service awards, awards for character traits, club awards, etc. and then moved on to academic awards. The first awards presented were for the eighth graders’ community projects. It was interesting to hear what kind of projects kids do for this graduation requirement—one kid instituted a composting system in the cafeteria, a group collected feminine hygiene products and bras for women in homeless shelters, etc. Then we found out which of the sixth and seventh graders were “Balanced,” “Caring,” “Knowledgeable,” and so on, who’d been active in various clubs (including Rainbow Alliance, which caused North to clap enthusiastically), and which middle schoolers had already completed their 75 hours of community service required for high school graduation. Three of them were sixth-graders, which meant they’d done it in just a year. Then it was time for awards for Music, English, Math, and Science. It was nice to see North’s friend Edwin win the sixth-grade Science Scholar award and a girl who used to be in Scouts with North win an award for both Math and English. Finally, we got to World Languages. Kids in the French immersion program who’d scored a platinum, gold, silver, bronze or honorable mention on a national French test were first on the program, but to our surprise, they weren’t called to the stage by name, just asked to stand in their seats en masse. And it was the same with the Spanish immersion students. This was a disappointment for North and for us. I’d been looking forward to seeing not just North but their friends Norma and Claire go up to the stage and get their Spanish exam awards, as I’ve known them since the kids were all in elementary school together. And it would have been nice to see North’s new friend Xavier collect his bronze award for the French exam, too. To make matters worse, kids in non-immersion language classes were called to the stage for awards such as most improved. We weren’t alone in being surprised and dismayed. I’m not on the school listserv, but Beth told me the next day there were a lot of irate immersion parents complaining there. I understand that it’s a very long program and they wanted to save time, but this seemed a clumsy way to do it. It might have been better to leave the French and Spanish exam awards off the program all together rather than to treat one group of kids differently than all the rest. Beth had asked me earlier if we could cut out after North got their award and go for frozen yogurt. I’d been mulling it over, thinking it might be rude to leave in the middle, but I wasn’t in the mood to see any more kids walk up on stage, so we did leave. North took the time to find their friend Giulia, who’d won a gold award on the Spanish exam, to give her a congratulatory hug. 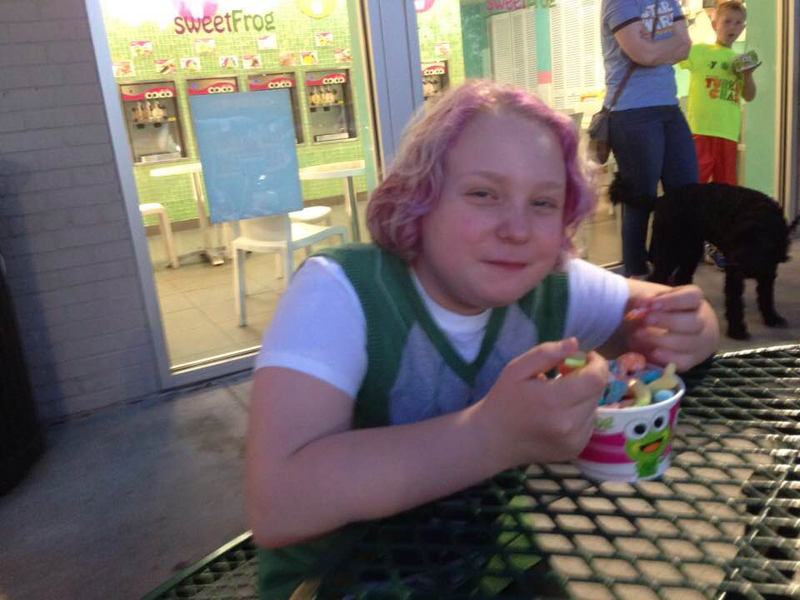 Shortly after we got to Sweet Frog, a boy we know (seventh-grade Spanish immersion Outstanding Linguist) and his mom and older brother arrived and we had a nice talk with them. I used to see his mom or dad every day at the bus stop when our kids (first the older pair, then the younger ones) were in elementary school, but we rarely see each other now, so I was glad about that. “Cotton candy,” North said, probably figuring she couldn’t see the frozen yogurt under the copious neon-colored gummy products they had piled on it. And North, who had been indignant a little while earlier, didn’t seem too upset anymore, so maybe it was.